Dr. Nazir S. Musaji, B.Sc., O.D. Dr. Nazir Musaji is a staff Optometrist working and managing both the Mississauga and Pickering Eye Care Centres. He completed his undergraduate studies at University of Toronto in 1988, majoring in Microbiology and Biochemistry. Dr. Nazir then attended the Pennsylvania College of Optometry in Philadelphia, where he graduated with honors in 1996 with a Doctor of Optometry degree. 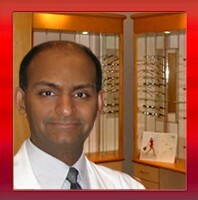 Dr. Musaji is board certified by the Canadian Examiners in Optometry as well as the College of Optometrists of Ontario. Furthermore, Dr. Musaji is a member of the Canadian Association of Optometrists (CAO), the Ontario Association of Optometrists (OAO), and the American Optometric Association (AOA). He is also certified to prescribe Ophthalmic medications for the impending Therapeutic Pharmaceutical Agent (TPA) legislation allowing Optometrists to prescribe Ocular pharmaceuticals in the Province of Ontario. Dr. Musaji’s primary areas of interest are the diagnoses and treatment of eye diseases and emergency eye care, contact lenses, eye glasses, cataract and refractive surgery co-management. He has established a strong co-management relationship with other health and eye care providers for the betterment of all his patients’ ocular requirements. He has been practicing in the GTA since 1997 and he speaks English, French, Gujarati and Katchi. Dr. N. Musaji continues to strive to develop Mississauga and Pickering Eye Care Centres as the premier Optometric Clinics of their respective communities. D. Michael S. Lam, B.Sc., O.D. 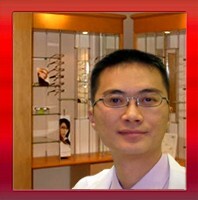 Dr. Michael S. Lam is a staff Optometrist working at both the Mississauga and Pickering Eye Care Centre. He completed his undergraduate studies at McMaster University in 2000, majoring in Biochemistry. Dr. Lam then attended the Pennsylvania College of Optometry in Philadelphia, where he graduated with honors in 2005 with a Doctor of Optometry Degree. Dr. Lam is board certified by the Canadian Examiners in Optometry as well as the College of Optometrists of Ontario. Furthermore, Dr. Lam is a member of the prestigious Beta Sigma Kappa International Optometric Honor Society (BSK), the Canadian Association of Optometrists (CAO), the Ontario Association of Optometrists (OAO), and the American Optometric Association (AOA). He is already certified to prescribe Ophthalmic medications for the impending Therapeutic Pharmaceutical Agent (TPA) legislation allowing Optometrists to prescribe Ocular pharmaceuticals in the Province of Ontario. Dr. Lam’s primary areas of interest are the diagnoses and treatment of eye diseases, contact lenses, cataract and refractive surgery co-management. He has been practicing in the GTA since 2005 and enjoys providing complete family eye care to patients of all ages. He speaks English and Cantonese.